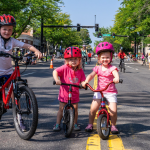 3rd Annual Center Streets was big success! 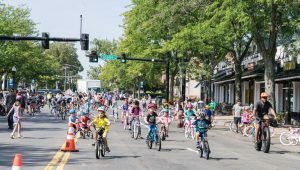 Center Streets 2018 is coming! Watch for signs! 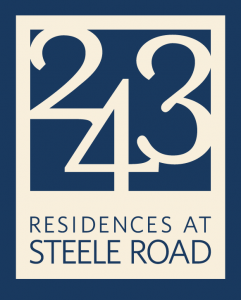 Thank you to key sponsors. 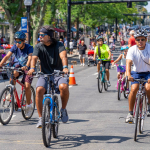 Celebrate West Hartford Bike Ride! Date: Sunday, June 10, 2018. Starting location: On Raymond Road in front of the police station. Ending location: The corner of South Main Street and Burr Street. 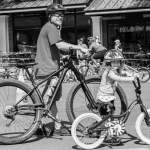 Do you have a used bicycle in your basement or garage that’s ready for a new owner? 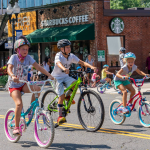 Bring adult or children’s bikes to the brand-new REI West Hartford store at Corbin’s Corner shopping center, 1417 New Britain Avenue, on Saturday, May 12th, 2018 between 10am and 6pm. 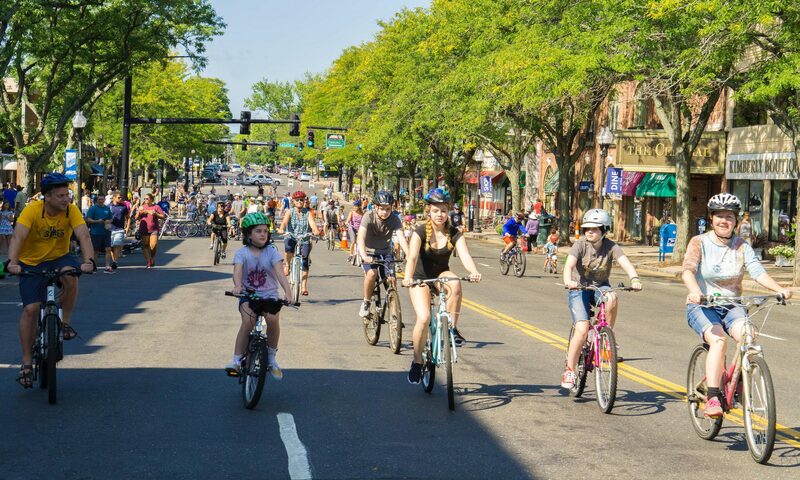 Your bicycle will be donated to Hartford’s community bike shop, BiCiCo.org, which repairs and “up-cycles” bikes for people in need. 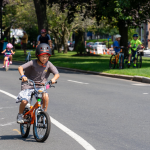 BiCi Co, which merges the Spanish words “bicicleta” (bicycle) and “comunidad” (community), was created by the Center for Latino Progress in Hartford in 2015, and is located at 97 Park Street, at the crossroads of the Downtown, South Green, and Frog Hollow neighborhoods. BiCi Co hosts the Earn-A-Bike program for youth to learn bike maintenance and safety, Do-It-Yourself mechanic hours (including a bustling Women’s Only DIY Night), and recently opened a bike shop storefront. 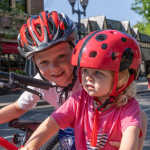 This non-profit organization welcomes volunteers and supporters to get involved in a growing and collaborative bike-friendly community. 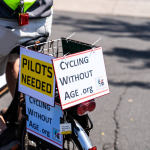 For more information, contact BiCi Co Program Manager Joe Dickerson (Joe_Dickerson@ctprf.org). 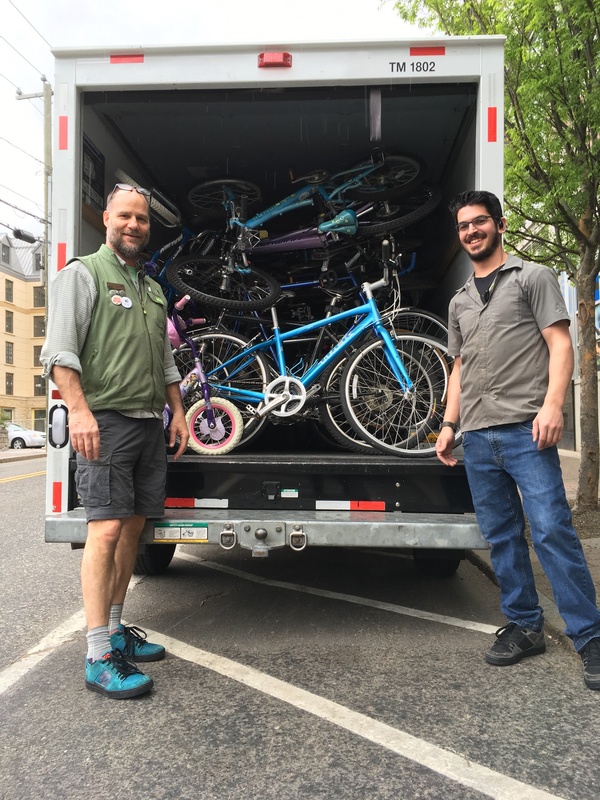 Volunteers from BikeWestHartford.org will help REI staff collect bikes and transport them by rental truck to BiCiCo. To volunteer for this event, contact Jack Dougherty (jackdrty@gmail.com). 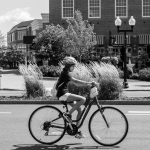 Bike West Hartford invites all to join Bike to Work Day Hartford Celebration. Friday May 18th, 2018 from 6:45 – 7:30 a.m. at Spot Coffee, 65 Memorial Drive, West Hartford in Blue Back Square. Just before entrance to Memorial Drive parking garage. We will leave for The Old State House, Hartford at 7:30 a.m. for festivities there. 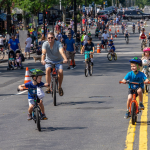 Folks of all ages are invited to “take to the streets” for a care-free and car-free summer morning in West Hartford Center on Sunday August 27th from 9am to 1 p.m. 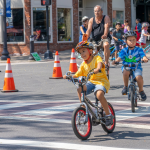 This second annual family-friendly event expects to surpass last year’s estimated crowd of 2,000 participants, and will feature the West Hartford Police Department hosting a bike rodeo and free bike registration. 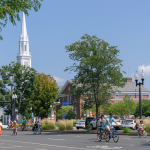 The town will close traffic on four roads that form a rectangular loop around the central business district: Farmington Avenue, South Main Street, Memorial Road Extension, and LaSalle Road. Ride your bicycle or scooter, or take a stroll down the street, without automobiles. 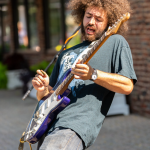 Participating restaurants will offer brunch specials and free surprises, many merchants will feature discounts, and live music will be performed all morning. 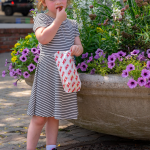 Children will be able to play hula-hoop, jump rope, and draw with chalk in streets closed to traffic. 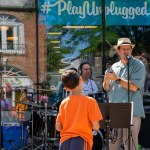 “Our first year of Center Streets was beyond amazing,” recalled co-organizer Ethan Frankel. 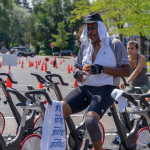 “We were thrilled with the massive turnout and everyone wearing smiles.” He was inspired by car-free summer events that have become increasingly popular in New York City and elsewhere around the globe. Residents tell co-organizer Edward Pawlak that they’re looking forward to this ‘open streets’ festival. 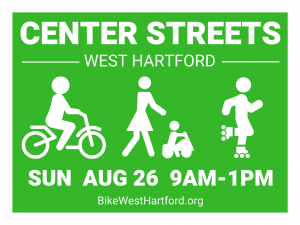 “We would love for it to become an annual summer event, with support from the Town of West Hartford.” Center Streets is the signature community initiative of Bike West Hartford, Inc., a non-profit organization that promotes bicycle-friendly policies and programs in town. 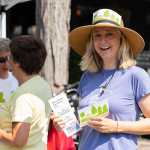 Financial support for Center Streets is being provided by many local business and residents, including Whole Foods (principal sponsor), United Bank, West Hartford Police Officer’s Association, Scott Franklin & Associates, Inc., Farmington Savings Bank, Bloomfield Bike Shop, Filomeno, Thomas Fahy Insurance, Keating Insurance, Berkshire Bank, Simsbury Bank, Connecticut Ecosystems LLC, the MDC Water Wagon, Daniel Johnson, Dan Firestone, and the Frankel Family. 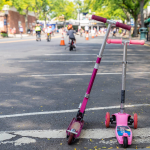 Dust off your bikes, scooters, and strollers, and meet up at Center Streets! 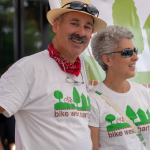 If you need an email address for your work with BikeWestHartford, contact Jack Dougherty (jack@bikewesthartford.org), who can create an account and send your your email address and password. 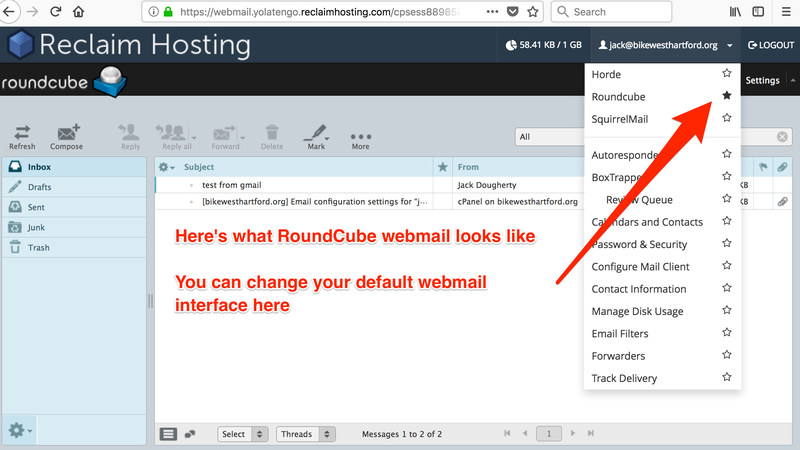 The first time you login, choose your preferred webmail interface. 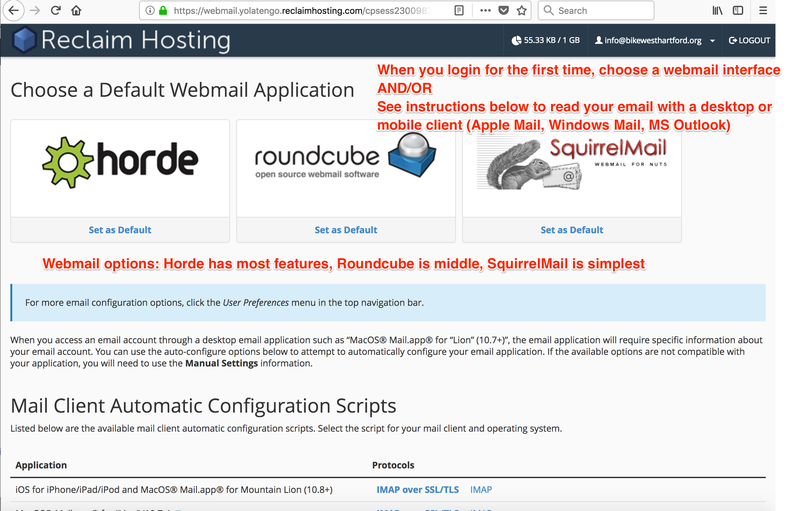 The options range from Horde (lots of features) to RoundCube (mid-level) to SquirrelMail (simplest). Or scroll down to “Mail Client” instructions if you wish to set up your email to read on a desktop or mobile client (such as Apple Mail, Windows Mail, MS Outlook).